to help you make responsible seafood choices on the go! Traveling throughout Portugal this year, I've been delving into the world of the local seafood, researching and finding out which species are the best choices to eat, and which should be spared: placed on standby while their stocks recover. 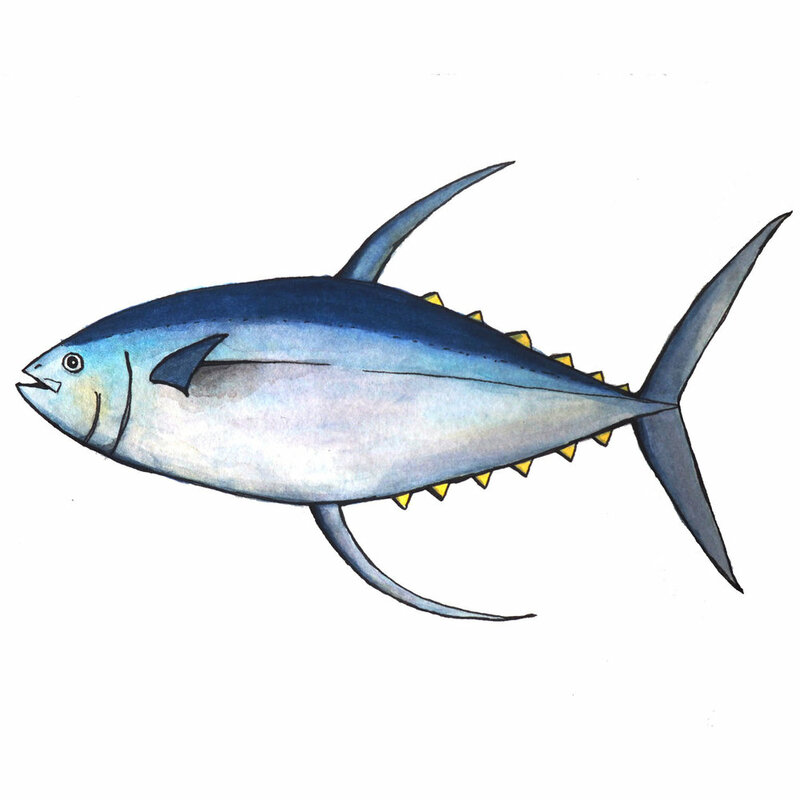 While most Tuna species are severely over-fished, particularly the Bluefin, the Albacore tuna is a good alternative to the other Tuna species, with a high future health predicted, as it’s surface level pole/line caught. However all Tuna contain heavy metals like Mercury. Best choice alternatives: Albacore tuna. With the frequency Cod appears in Portuguese dishes, you might have thought it was a locally-caught species. In reality, these chunky fish are industrially fished in the chilly waters of the Baltic and Northern Atlantic, with vast quantities of by-catch. Their status is Vulnerable. More here and here and here! While its at the heart of every Portuguese tasca: the sardine is not as prolific as it might seem. Unfortunately in recent years, the fishery has collapsed. Better Omega-filled alternatives are Chub mackerel, horse mackerel, and anchovies, whose populations are in a healthier state. While abundant, squid stock dynamics are often more affected by environmental variables than fishing pressure. 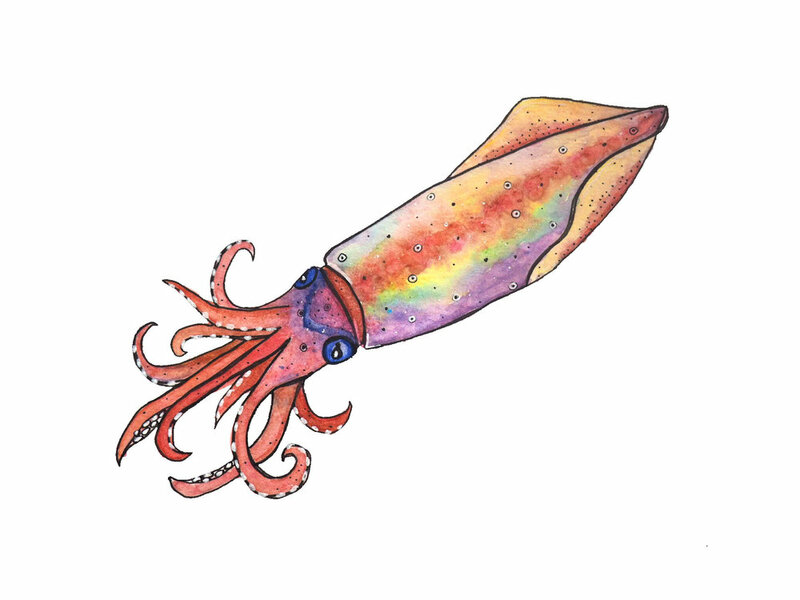 However, landings of squid worldwide have been increasing in recent years, possibly as a result of declining fish populations, and also as a consequence of ecosystem changes affecting squid abundance. Typically they are usually caught by bottom trawl, but also by jig, or gill net. The King of Mackerels, the Carapau is a great choice in Portugal, an a good alternative to Sardines. They are also chock-full of healthy Omega-3s, and have a very healthy future population predicted! Best choice are Purse seine caught. Brown crab stocks are largely located in waters surrounding the UK, Rep of Ireland and north western France, and are imported to Portugal. They are caught by low impact pots (preferable) or gill-net. Salmon found in Portugal is produced by Aquaculture in Norway and the Faroe Islands. The fish farming there typically pollutes the sea significantly because of organic waste, (food leftovers, feces), chemical pollution, (antibiotics and other medicines that allow growth in enclosed space), and fish that escape by spreading parasites and diseases. The proportion of feed required to produce 1 kg of salmon is 1.4: 1 in Norway and 2.7: 1 in the Faroe Islands. Probably the most intelligent spineless creature in the sea, Octopus skin color and texture varies depending on their mood and habitat. These cephalopods feed on crustaceans - particularly crabs - with their rigid beaks. Octopus are fished by trawl, pots and cage traps, but are most often taken as bycatch in trawl fisheries for other species. If possible, choose those caught by less damaging capture methods, e.g. pot caught, and avoid beam trawl by-catch octopus. Note: they might also contain Mercury. These Grooved Carpet Shells are found in the NE Atlantic and the Azores, where it inhabits sandy bottoms and silt, intertidal areas on the coast, lagoons and estuaries. These clams feed on micro-algae that it filters from the surrounding water. 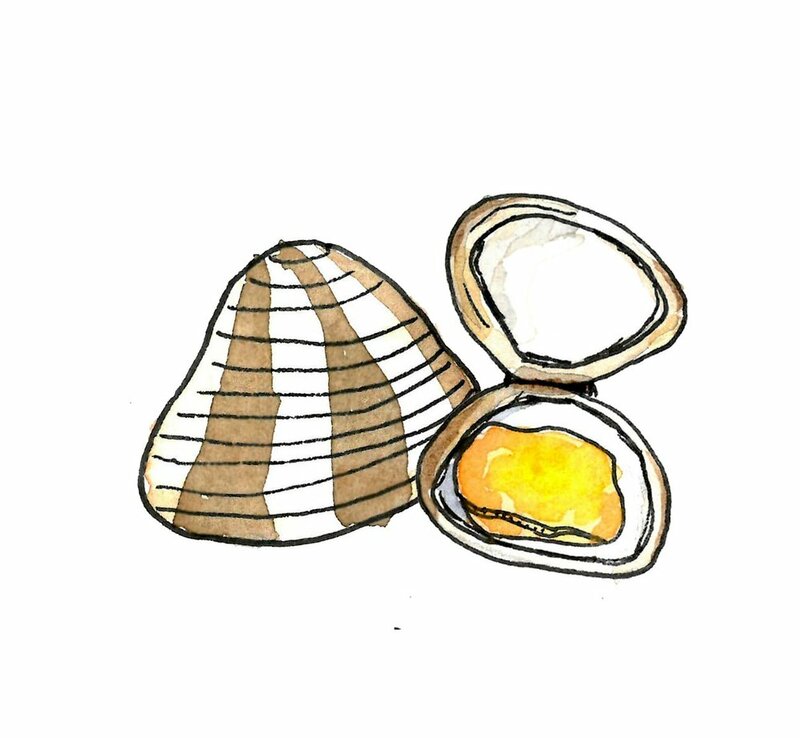 They are the main bivalve species produced through aquaculture in Portugal, and are harvested by hand with a modified knife with a wide blade. These strange-looking creatures live on intertidal rocks, often off the Algarve, where they are hand-foraged by divers. Inside the “arthritic parrot claw” exterior is a sweet, briny tender barnacle bite, sometimes selling for the highest prices at the market due to the dangerous nature of their retrieval. Available Spring/ Summer. Avoid Oct-April, when it is forbidden to capture them. The Mackerel fishery is on the whole thriving, and is a great alternative to sardines. They are low Cholesterol, and full of healthy Omega-3s, and are usually caught by purse seine nets or midwater trawls. Cavala look very similar to Sarda, but the Cavala has freckles on its belly. Shrimp are caught with heavy trawl gear on huge industrial ships, and are fished to an unsustainable scale where the populations are on the brink of collapse. Trawling of these shrimps also results in vast amounts of bycatch and damage to sensitive, protected or endangered species (such as young fish and sea turtles, corals and organisms fixed to the seabed.) The giant Mozambique shrimp are a huge problem: 82% of shrimp exported by Mozambique goes to the EU, mainly to Spain and Portugal, and cause vast ecological destruction. A chunky, predatory fish with a huge mouth and a grumpy expression, the stone bass or wreckfish is a huge deep sea fish which is occasionally landed by fishermen by hook & line. They are very long-lived - up to 80 years! The salty sip of love! 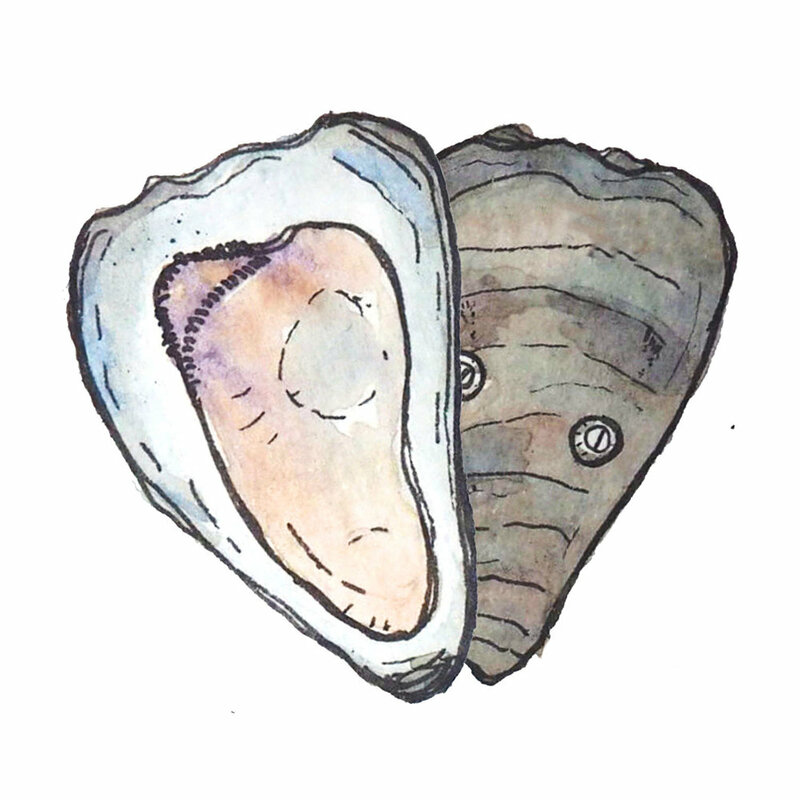 Oysters are largely produced by Aquaculture in the Northeast Atlantic and along the Portuguese coast. They are placed on floating rafts in estuarine areas, from which they are later harvested. They are great for the local ecosystem, as they are filter-feeders and clean the waterways. The majestic cephalopod, Cuttlefish also have 8 arms and two tentacles, like squid, but differ from other cephalopods by the presence of an internal skeletal/ buoyancy structure: the cuttlebone. Despite their charm and relative intelligence, their fishery is of least concern. The catch method, by trap or hook and line, is a very low impact fishing method but large removals of cuttlefish on the ecosystem is a concern. They are also caught as by-catch by the octopus fishery. These slow-maturing, bottom-dwelling sluggish creatures are not known for their beauty, but their succulent flesh. However, the trawl fishing to retrieve them has expanded into deeper waters since the mid-1990s into areas believed to have been a haven for the adult monkfish, which has lead to greater population vulnerability to overfishing. Sea bass is a carnivorous fish that is either raised via aquaculture, or caught by line or intensive bottom trawl. The population of the Western North Atlantic has declined in recent years because fishing has been very intense giving no opportunity for its recovery, and has very impactful ecological effects. There are no quotas for the species and the fishing pressure is still too high. Management is only partially effective. In the Eastern Atlantic and the Mediterranean this fishery is not regulated. In general, seabass aquaculture is unsustainable, due to the amount of wild fish needed to feed them, (about 5 kg of wild fish to 1 kg of body weight that is produced). There can also a high amount of antibiotics used, and vast amounts of ecological waste produced by this aquaculture. These barnacles are a salty succulent snack that has little impact on the environment. They are seasonally collected from rocks and tide pools. However, the Azorean variety has been over-harvested. While you might fear these creatures: sharks like these bottom-dwelling dogfish are actually in trouble. They are long-lived, slow growing, and are very vulnerable to fishing threats in their poorly managed fisheries. In addition, they often contain high levels of mercury in their flesh, so its not advisable to consume them. Salmonete is a red fish commonly seen on menus across Portugal. It’s a bottom feeder, and it uses its prominent barbs for sifting amongst debris on the ocean floor for food, so the environment in which it forages can easily affect its flavor. As a bottom feeder, they are caught by bottom trawl, which can be destructive to the environment. This deep-living fish with massive eyes is widely distributed around Portugal in deep-sea coral habitats. They are slow to grow, with typically long lifespans, and unfortunately it’s fished in a destructive manner with deep water trawls. The silvery king of the Alentejo coast is happy to slip onto your plate. These fish are usually line-caught, and are currently not in scientific decline. They have strong little teeth which they use to feed upon their mollusk-prey. This "cardinal of the seas” is pot-caught in the NE Atlantic off of the UK and France, and is then imported to Portugal. The fishery is well-managed on the whole, although many are unfortunately still caught “with eggs,” which is against lobster fishery policy. Overall, Dourada tends to be relatively resistant to overfishing. Golden sea bream is usually produced by aquaculture in the Mediterranean Sea in large-scale cages, or tanks. Unfortunately, the production of 1 kg of farmed fish requires more than 4 kg of wild fish in the form of fishmeal or fish oil, and their food does not come from sustainable sources. The production of Dourada in cages has many negative environmental impacts. To combat the high risk of disease and parasite spread, large-scale nutrients, chemicals and antibiotics are often added to the environment, also affecting wild populations. These odd-looking razor clams are in sharp decline. The fishermen catching razor clams by hand have been outdone by trawlers that rake the sands mechanically, overfishing the lingueirão to the extent that they have been all but wiped out locally. The clam's body is mostly its foot, which it inflates with water to propel it beneath the sand. Once at a safe depth, the lingueirão clam anchors its inflated foot into the sand, before deflating it to draw down its protective shell. Corvina can grow VERY large - you might see their colossal forms at fish market counters in slices. During the breeding season of April to July, they produce a sound similar to snoring, to attract individuals to the spawning ground -- fishermen use this same sound to locate & catch the fish with gill and trammel nets. The delicious Blue Mussel lives in estuaries and ocean habitats, inhabiting rocky intertidal zones. They are picked by hand, and are also produced by aquaculture in the open ocean, particularly off the Algarve coast. They are starfish’s favorite food! 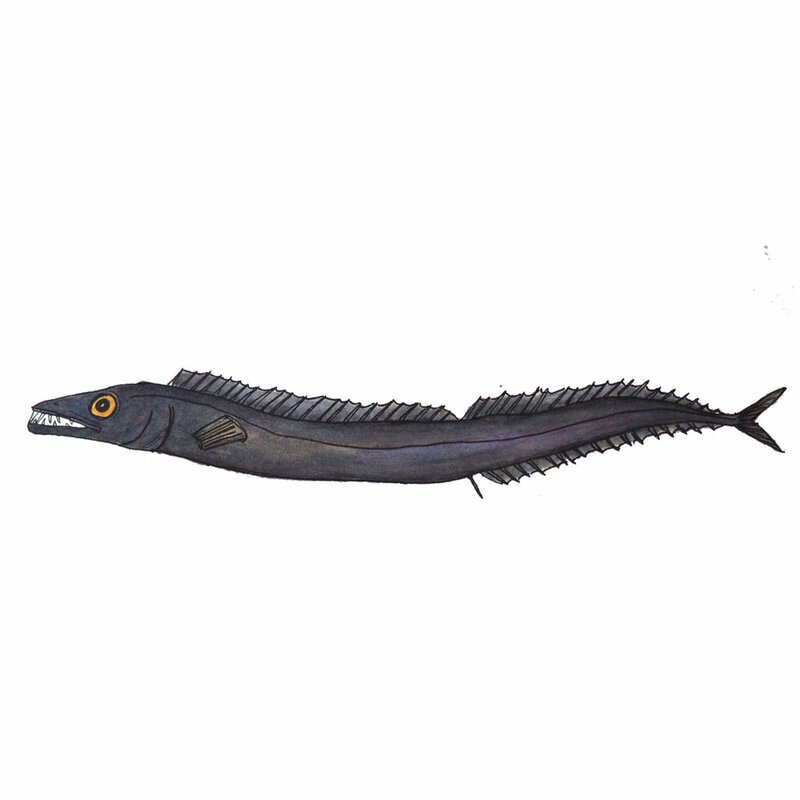 Parga are found in the NE Atlantic, Madeira Islands and the Mediterranean, and are typically fished with gillnets. Juveniles are found in shallow sheltered areas, migrating to deeper zones throughout their life, down to 300m. They feeds on other fish, crustaceans and cephalopods, and spawn in spring and early summer. This creepy-looking fish has a long life cycle, slow growth, and low reproductive rate, which make it very sensitive to changes in the environment. They inhabit the deep waters off mainland Portugal, and also in the archipelagos of Madeira and the Azores, where they are fished with intrusive 1km longlines, or destructive trawls. They are also known to contain high levels of Mercury, making it toxic in large quantities. While their population is decreasing, Garoupa can be found along the Bay of Biscay in the NE Atlantic to the Azores, Mauritania and the Canary Islands, the Mediterranean coast of Morocco, Algiers and southern Spain. It is one of the species targeted by the local semi-subsistence fishing industry around the Azores, of which the main catching methods are rod and line from near-shore boat, and coastal nets (Moranto et al. 2000). Its near-coastal habitat is likely to have been degraded by pollution from human settlements, including agricultural runoff and sewage. Let me know if you're interested in purchasing a print of one of the fish! I am ALWAYS happy to share the seafood love. Portuguese fish guide you'll be ready to face any menu! What fish do you recommend/ what is most fresh? -- Que peixe você recomenda / o que é mais fresco? Was this fish caught locally? -- Este peixe foi pescado localmente? Do you know how was this fish caught? -- Como esse peixe foi capturado? Now: hit the beautifully tiled streets & enjoy your responsibly-sourced local seafood in Portugal!